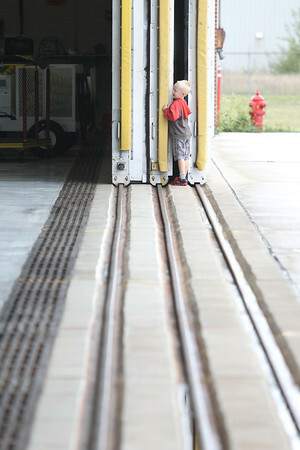 Redding Williams (cq), 5, plays in the doors of the hangar at U.S. Coast Guard Air Station Traverse City during its open house Saturday. Williams is the son of AST 1 Jodi Williams. The base's hangar was open, with service members offering tours and demonstrations of aircraft and rescue equipment.